Carbon monoxide is an extremely harmful, odorless and colorless gas that tends to threaten families more during the winter months than other times of the year. Carbon monoxide (CO) is dangerous because it replaces oxygen in the blood, interfering with the transport of needed oxygen to cells in the body. Poison control centers and hospitals receive increased numbers of cases involving CO especially during hurricanes and snowstorms due to improper use of gas stoves, generators and grills, as well as snow-blocked exhaust pipes on cars. Carbon monoxide can also enter your home through fireplaces, hot water heaters, kerosene heaters, furnaces and dryers with clogged ductwork. Because there is no way to know you’re inhaling CO and symptoms of excessive exposure often resemble the flu (sleepiness, dizziness, headache, nausea), it’s extremely important you and your family take the proper precautions to protect yourselves, particularly during winter. Install carbon monoxide monitors in your home and make sure they have fresh, working batteries. If you know you won’t remember to replace the batteries of your detector on a regular basis, get one that plugs into an outlet; just don’t plug it into an outlet that’s controlled by a switch. If you lose heat inside your home, never use gas ranges or ovens to keep warm. In the event of a power outage, gasoline-powered generators should only be used outdoors, away from vents or windows, and at least 25 feet from your house. In the event you need to warm a vehicle, remove it from the garage immediately after starting it. Do not run a vehicle or other fueled engine or motor indoors, even if garage doors are open. 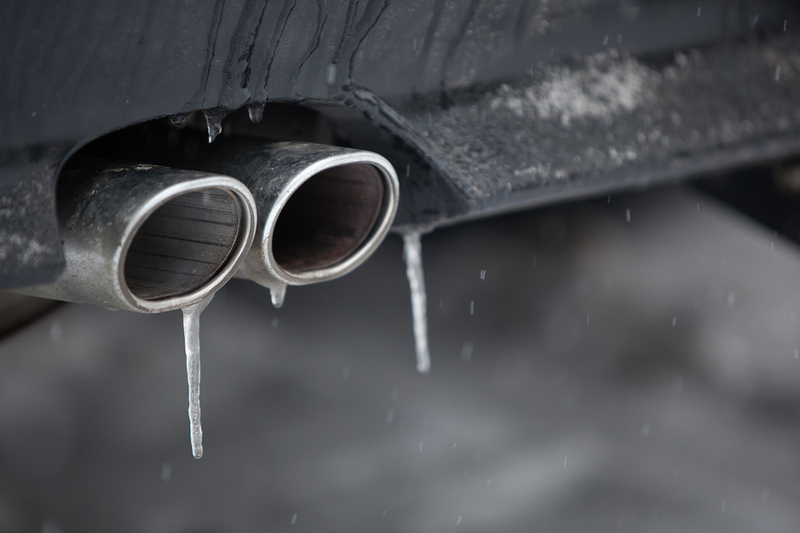 Never sit in a car with the engine running if deep snow or mud is blocking the exhaust pipe. Clear anything obstructing the car’s exhaust before you start the engine. Make time to have your home heating systems (even chimneys and vents) inspected and serviced annually by a trained technician. It’s ok to enjoy your fireplace when temperatures drop, but also remember to open the damper before lighting fires and keep it open until the ashes have cooled. An open damper could prevent build-up of poisonous gases inside your home. During and after a snowstorm, make sure vents for your dryer, furnace and stove are clear of snow build-up. Although some still enjoy utilizing their grills during the winter months, never use any gasoline-powered equipment indoors, or in a garage or basement. If you or anyone in your family show signs of carbon monoxide poisoning (headache, dizziness, nausea, fatigue and confusion) go outside to fresh air immediately, then call 911. Remember, installing detectors is your best defense against accidental carbon monoxide exposure. There are three basic sensor types on carbon monoxide detectors: electrolytic, colorimetric and metal oxide semiconductors, which all have the same results. However, the US Consumer Product Safety Commission (CPSC) recommends you purchase and install carbon monoxide detectors labeled UL 2034, confirming they’ve met the requirements of the new Underwriters Laboratories, Inc. standard, which has a greater safety margin. Consider detectors like Halo+ or Nest Protect, which detect smoke as well as CO, plus utilize smart-technology by connecting to your phone for customization and integration with other smart appliances/tools. Stay warm, but moreover stay safe!